I spend a lot of time trying to get people to eat spiced lamb. Lamb has always been a funny one for me. Apparently I adored it as a small child, and came to really, really dislike it/ refuse to eat it in my late teens. More recently I’ve discovered that lamb can be awful if you get cheap, bad quality meat and don’t cook it properly, but absolutely delicious if you take the time to source the good stuff and cook it with care: case in point, I had some divine lamb ribs at DUCKSOUP in Soho the other week (review coming soon!) that I’d recommend to everyone whenever they’re on. 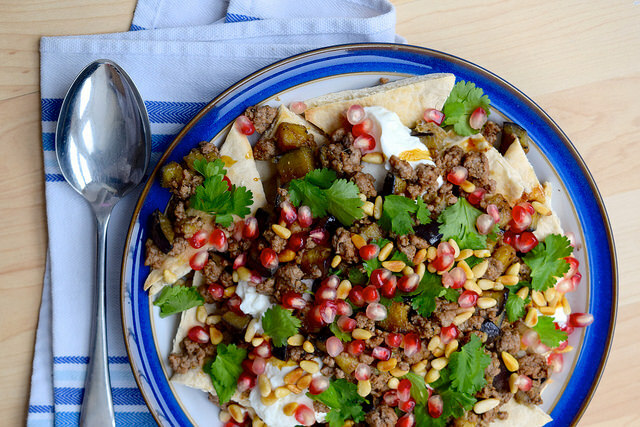 I’m a big advocate of spicing lamb mince, because I find it is the best way to turn lamb haters into lamb eaters, especially when you can go in a Middle Eastern direction and load it up with all types of fresh herbs, bright, tempting colours and fresh flavours. 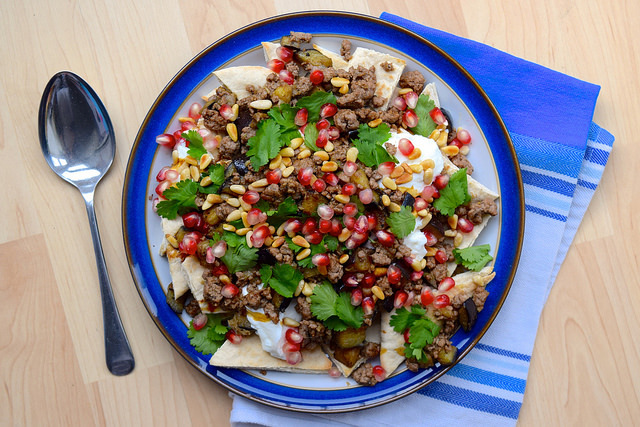 Another thing I love about this recipe is that while it can serve three people as a meal and four if you’re serving salad or other mezze with it, it only uses 250g of lamb mince. I know one of the biggest barriers to people buying better quality and better tasting meat is the price, so why not just use less of the good stuff by being smart with it? PGI Welsh Lamb sent me a kilo of mince to play with, so I’ve now got a few bags stashed in the freezer so I can perhaps make my Greek Lamb Pattie & Vegetable Tray Bake or the Spiced Lamb Patties with Light Tzatziki and Pitta Bread from Student Eats for dinner over the next couple of weeks. 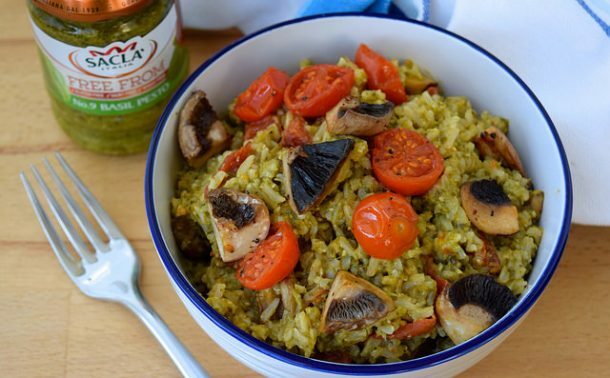 This is quite versatile, so while I say it serves 3-4, if there are just two of you cut down on the pitta to make it a manageable meal. I’m terrible at breakfasts so I have a habit of eating leftovers of anything I can get my hands on for breakfast – this does not keep well! 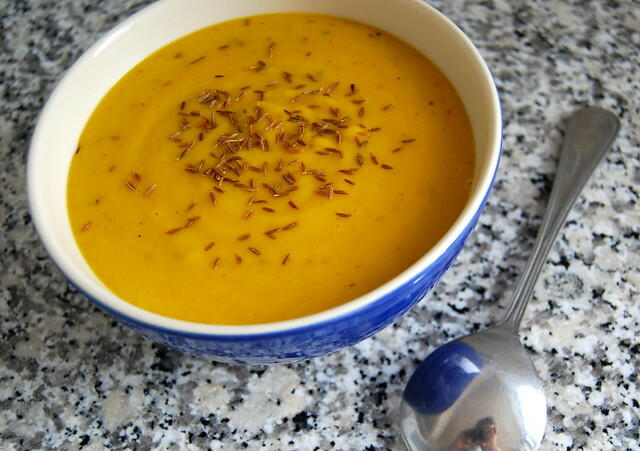 It is so versatile, so you can happily add any other Middle Eastern ingredients you have to use up to the mix. It will take around half an hour to make, less if you’re using a smaller aubergine than I did and a bigger pan. 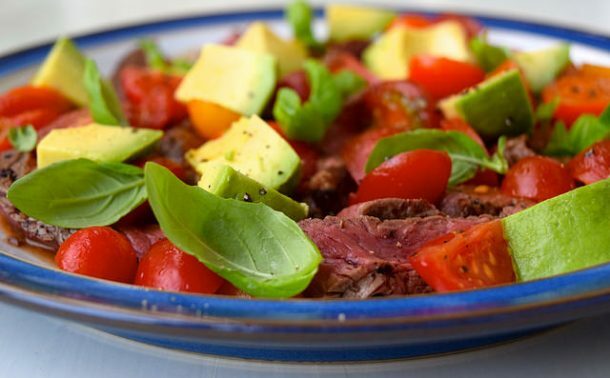 Weeknight cooking is not about sticking to an exact schedule! 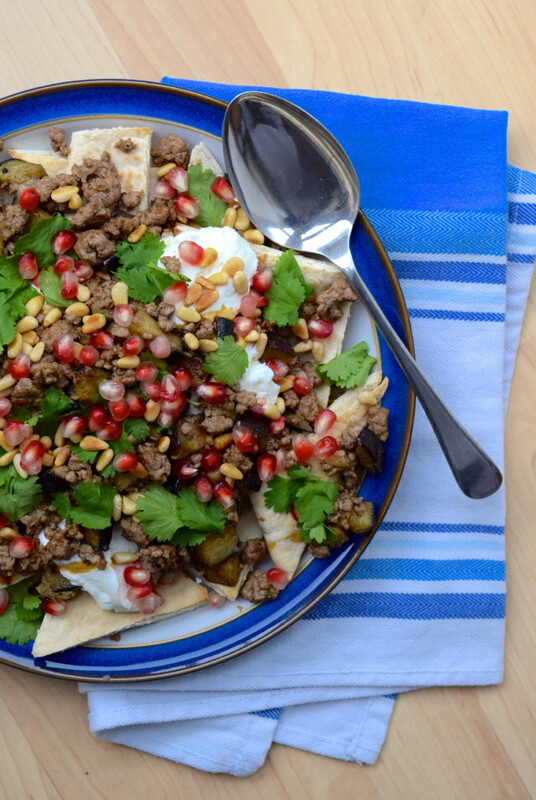 A great sharing, weeknight dinner dish with delicately spiced lamb and bright pomegranate jewels. First, toast the pine nuts until golden in a large, dry frying pan over a medium heat. Keep an eye on them as they can turn quickly from toasting to burnt. Meanwhile, top, tail and dice the aubergine into small cubes. Remove the pine nuts from the pan and set aside. Turn the heat up to high and add the aubergine along with a generous glug of chilli oil and some seasoning to the pan. Stir fry until the cubes are starting to soften and brown, then add the crushed garlic, cumin and the mince to the pan. Stir the mince into the aubergine and break it up as it browns with a wooden spoon, turning the heat down to medium high. 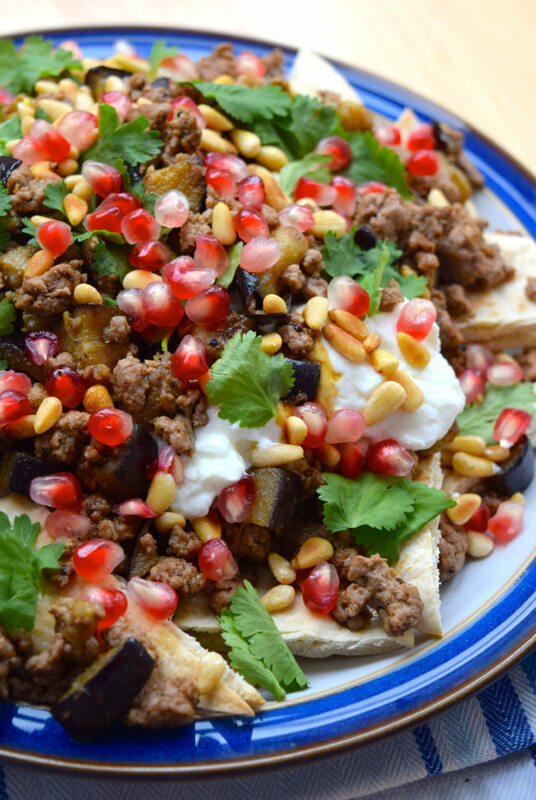 While the lamb is cooking (it will be brown, starting to brown a little and very aromatic once it is done) toast the pitta (you can do this under a hot grill or in your toaster) until they’re golden, then using scissors cut into nacho shapes. This can be done in advance if you wish. 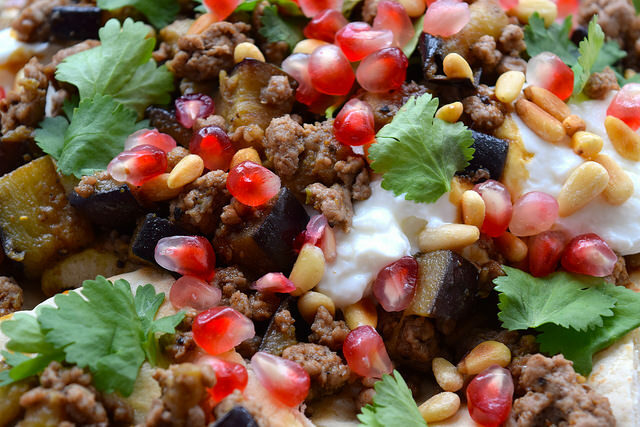 To serve, arrange the pitta on the plate then spoon over half the mince and aubergine mixture. Spoon over the yogurt, then the rest of the mince. 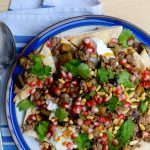 Scatter over the pine nuts, pomegranate seeds and coriander leaves, then finish the plate with a generous drizzle of pomegranate molasses. Enjoy immediately!